During World War II, the Wehrmacht developed the first assault rifle to be issued on a large scale. The StG44 was chambered for the 7.92x33mm round, a cartridge of lesser power and more compact size than that fired by the standard infantry rifle. Because studies had shown that most infantry combat occurred at relatively short engagement distances, it was deemed needlessly wasteful to continue using the heavier, bulkier ammunition. In contrast, when Germany’s paratroopers undertook the development of the FG42—the world’s first practical, select-fire, battle rifle—they chose to use the full-power, 7.92x57mm service cartridge. Because they had been outranged by British riflemen and machine gunners during the early stages of the 1941 airborne assault on Crete, the paratroopers reasoned that it was decidedly better to have long-range capability and not need it, than to desperately need it and not have it! After WWII, these opposing philosophies appeared again, during the effort by NATO countries to adopt a standard rifle cartridge. One faction advocated the .280 British assault rifle round, while the U.S. Army wanted to retain the range and power of the .30 caliber cartridge then in use. As the most influential member of NATO, the United States got its way, and the 7.62x51mm round became NATO-standard shortly after the end of the Korean War. Another reason the U.S. preferred full-power ammunition was to simplify logistics. The Army had fought WWII and the Korean conflict with a wide variety of small arms, chambered for two different calibers. The standard .30 caliber cartridge was used in the M1 infantry rifle, M1D sniper rifle, M1918A2 Browning automatic rifle, M1917A1, M1919A4 and M1919A6 machine guns, while the .30 Carbine round was fired in the M1, M1A1, M2 and M3 carbines. The Army wanted to replace this menagerie with only two basic weapons—a rifle and a general purpose machine gun—and one caliber of ammunition. Sadly, this very worthwhile objective was doomed to failure. The substantial recoil of the 7.62 NATO round caused the M14 rifle (right) to have poor controllability in full-auto fire, even in the heavier, M14A1 automatic rifle version. And, by insisting on a full-power cartridge, the Army ensured that the M14—which was originally intended to be a “light rifle”—would be nearly as heavy as its predecessor! 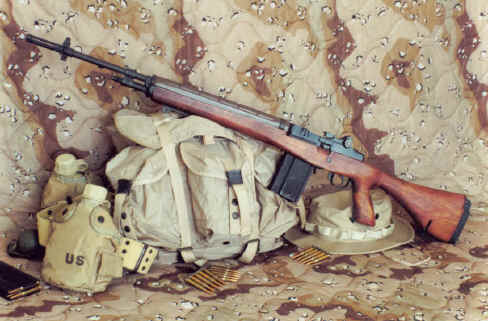 The weight factor, perhaps more than any other, sealed the M14’s fate. In the early 1960s, the Air Force—which had previously refused to adopt the M14—purchased the AR-15, a rifle that was almost as delightfully lightweight as the obsolescent carbines then in its inventory. Not long after that, the Secretary of Defense directed the Army to also buy the AR-15 (subsequently dubbed the M16A1), and discontinue acquisition of M14 rifles, thereby forcing the Army back into a two-caliber system. Could the Army have taken a course that would have avoided a two-caliber system? Clearly, not by sticking to the demand for a full-power 7.62mm round. As the British had correctly noted, the power of the ammunition determines the size and weight of both the cartridge and the weapon. Nor could it have been avoided by adopting the .280 British caliber. Every nation that has issued assault rifles to its armed forces has found it necessary to also retain a full-power cartridge in the inventory for use in machine guns and sniper rifles. Infantry rifle: The weapon and ammunition should weigh as little as possible, consistent with a maximum effective range of at least 500 meters. Machine gun: Same weight considerations as for the infantry rifle, but with maximum effective range of 1100-1200 meters. Ball ammunition should be able to defeat “hard” targets at least as well as 7.62 NATO rounds. Tracers should be visible to over 800 meters during daylight. Sniper rifle: Weight of weapon and ammunition is not as important as accuracy and effective range, which should be greater than 800 meters, with a flat trajectory. Of the above characteristics, the sniper’s need for a flat trajectory and short time-of-flight to the target would seem to be the most critical, so that is the logical start point in designing the optimum small arms cartridge. In order to achieve a flat trajectory, the bullet must have a very streamlined shape and be propelled at fairly high velocity. A bullet’s shape can be judged by its “ballistic coefficient” (BC)—the larger the BC, the more streamlined the projectile. For instance, the Navy .300 Winchester Magnum load has a 190-grain bullet with a BC of 0.54, whereas the projectile of the 7.62mm M80 Ball round is only about 0.42. The .300 Win Mag’s high BC, combined with a muzzle velocity of 3000 fps, produces a very flat trajectory and short flight time. To incorporate these characteristics into the optimum cartridge will mandate the use of a bullet with a similarly high BC. In order to achieve the penetration capability needed by the machine gun, projectile weight will have to be substantially heavier than the 62 grains of 5.56mm M855 Ball. At the same time, it must also weigh less than the 147 grains of 7.62mm M80 Ball in order to minimize the infantryman’s load. A bullet weight of about 100 grains seems like a reasonable, if intuitive, compromise. Without resorting to exotic, expensive materials like tungsten or depleted-uranium, a 100-grain bullet with a BC of 0.54 will have to be made in 6mm caliber. 6.5mm and 7mm projectiles of this weight have inadequate BCs, while technical factors prohibit the use of such heavy, lead-core bullets in 5.56mm. A 100-grain, 6mm projectile that is launched at close to 3000 fps would have not only the flat trajectory of the .300 Win Mag, but it should also have penetration capability on a par with 7.62 NATO. 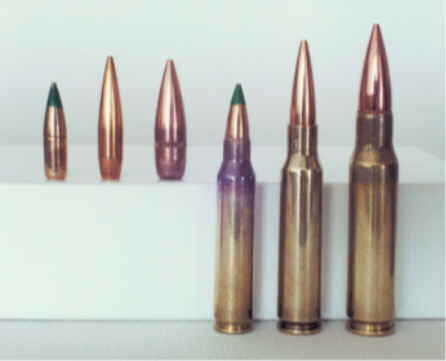 The photo below shows the 6mm Optimum projectile flanked by 5.56mm NATO and 7.62mm NATO, then the three with cartridges. Another benefit of 6mm ammunition is improved tracer performance. The 6mm XM734 round, developed in the 1970s at Frankford Arsenal, reportedly produced a trace that was visible in daylight to 1000 meters. That is better than either 5.56mm or 7.62mm tracer performance! The cartridge case for the “6mm Optimum” would naturally have to be larger than that of 5.56 NATO, but it would also be significantly smaller than 7.62 NATO. To minimize cartridge case volume, muzzle velocity might have to be limited to perhaps 2900-2950 fps, but this should still produce exceptional performance. In essence, it would be a magnum version of the 6mm XM732 Ball round made for the squad automatic weapon program in the 1970s. The Army had a logistically sound idea in trying to create a one-caliber, two-weapon, small arms system. Unfortunately, the wrong caliber was chosen, and a golden opportunity was lost. By insisting on developing the best 7.62mm cartridge, rather than the best possible cartridge, the logistical situation of today is at least as complex as it was in the 1940s, with the 5.56x45mm cartridge for use in the M16A2 rifle, M4 and M4A1 carbines, and M249 light machine gun, while the 7.62x51mm round is fired in the M21 and M24 sniper rifles, and the M60, M240B, and M240G medium machine guns. One caliber can do it all. By sending a 100-grain, very low drag bullet downrange at over 2900 feet per second, the 6mm Optimum would provide snipers with the flat trajectory of the .300 Winchester Magnum. It would give machine gunners the penetration potential and tracer capability of 7.62 NATO, thereby permitting the development of an infantry machine gun that is light enough to replace both the 7.62mm medium machine gun and the 5.56mm squad automatic weapon. And, by virtue of being a compact, lightweight cartridge, with low recoil impulse, it should also allow the creation of a combat rifle that is little or no heavier than the M16A2. The 6mm Optimum combines the best features of several existing cartridges into a compact, lightweight round that should be capable of all around performance unequaled by any other caliber. If the future brings about another quest for a single caliber common to the infantry rifle and machine gun, let the 6mm Optimum be the one for all! By 1945 the Germans had the tools they wanted for infantry, and considerable experience knowing what worked. The best equipped squads would have one or two MG42s for their main offensive firepower. Most soldiers would have an SMG or STG for maneuver/CQB/Self defense -but, in most photos you'll see there was always at least one squad member that retained the Kar98 rifle. You see this in "Cross of Iron" in the warehouse scene -while the guys with automatic weapons keep the Russians back the rifleman takes his time and makes them count. The idea of intermediate rounds (optimized for 500m or less) was a German wartime concept. The usual explanation you see is that in most of the world visibility prevents shooting at more than this range. Since MGs and snipers routinely shoot at greater ranges, the accepted explanation is obviously wrong! By 1942 the German army was very familiar with alpine and desert fighting-and it is very "un-German" that these would not have been figured into development of the intermediate rounds. My theory is this. It is accuracy not visibility that is the limiting factor. "DOD did the same kinds of studies for all kinds of terrain, same result/conclusions; usual infantry engagement was 300 yards or less (didn't matter what you were armed with, typical infantry could not get hits at greater than 300m unless shooting volleys in mass or using machineguns. I was a former USMC National Match M-14 shooter and I can testify that even then the average infantryman was not going to get hits beyond 300m.) If you are under 1000m you call company or battalion mortars or MGs or Mark 19 (full auto grenade launcher), artillery and air strikes are for better targets that are further off. The point is correct on not firing individual weapons at longer than 300m, you won't kill them and they can call fire down on you!" "If you sight a target element that far away it is much more tactically feasible to call in artillery fire or an air strike thus saving your infantry the suicidal need for a half mile movement to contact. If you don't have fire support it is better to get closer before engagement to limit your targets tactical options. 500 to 700 meters gives them room to do just about anything. Especially if you have let them know you were there by shooting at them from that distance. They may HAVE fire support!" I've been hearing about the poor performance of the 5.56mm round for two decades now - from this website to the Marine Corps Gazette. This round is said by experts to lack the power to be an effective small arms round for combat operations. In the last several weeks, a sniper has shot 11 people in the Washington, DC area with single 5.56 rounds. 9 of them apparently died almost immediately and a 10th, a 13 year old boy, only survived because he received almost immediate emergency medical care. This appears to be a fairly successful "field test" of the round lethality - what do the experts say? Ed: I noted that too. The accuracy is not in question, but the damage from non-lethal hits, and how easily the round is deflected by light debris like branches. Body armor also presents a problem for smaller rounds. My view is that a larger round would be better, but not worth the cost at this time. However, at least one powerful rifle, like the .338 LM, is needed for each squad. As a former Navy SEAL most of my real world experience was under very restrictive rules of engagement and CAS (Close Air Support) by AC-130's. My first is, what is the caliber of the 6mm optimum? I must conclude from Mr. Crist's comments, that it is smaller than the .280 caliber/7mm x 44mm cartridge. This was the losing British entry for the NATO round some fifty years ago. Stan Crist REPLY: The 6mm Optimum is .24 caliber, smaller than the .28 caliber British round you cited, and slightly bigger than the (.22 caliber) 5.56x45mm. My second question, what are the velocities and energy of the round at two hundred to one thousand meters? Bearing in mind that you need sufficient velocity and energy for the "business" of the round to be completed. REPLY: I don't have all of the data you'd like close at hand, but here are figures for zero and 1200 meters. I am not a ballistics expert by any means, but I believe that if the 6mm optimum has killing power combined with its flat trajectory and range stated in the article then you have a winner. REPLY: I think so, too -- but then I'm prejudiced. I loathe the M-16/M-4 due to it's poor design. Would it not be prudent to fire the 6mm optimum in a selective fire version of the Ar-180b? Which seems on the surface to be a more accurate and reliable weapons given it's bolt design. Armalite has apparently refined the design and from the reviews that I have read done an excellent job. The weapon is presently chambered for .223/5.56 x 45mm ammunition. REPLY: Having had no experience with the AR-180, I'm unable to offer an opinion. As conceived, the 6mm Optimum is a 6x48mm round, too long to fit in 5.56mm magazines. It is possible to use the 6mm PPC -- a shorter, but slightly fatter, 6x39mm cartridge -- in 5.56mm weapons, which is capable of nearly the same performance as 6mm Optimum, but this requires changing bolt and magazine, as well as barrel. As far as [Carlton Meyer's] infantry squad article goes BRAVO. I believe that a German Panzerfaust-3 to be more practical and economical. The nature of the U.S. military in dealing with new weapon designs is to try to "push the envelope" rather then get something that works. REPLY: Also, the US military seems to be afraid of the exposed warheads of weapons like Panzerfaust and RPG-7. their was an article about it in the September issue of Small Arms Review magazine it will be interesting to see how it works out for them. Keep up the good work. I made the example of the "6mm Optimum" seen in the G2mil article. It was made by necking down a .25 Remington case to accept a .24 caliber projectile, then shortening the neck to create a case length of 48mm. My 6mm Optimum (6x48mm) concept differs from the Chinese 5.8x42mm. Although muzzle velocities are about the same, the 5.8x42 uses a lightweight bullet with a mediocre ballistic coefficient, which means it will lose velocity quickly, and therefore is no more than a medium range round. The 6mm Optimum has a considerably heavier, very-low-drag bullet with an excellent ballistic coefficient, to be effective at long distance. In my opinion, the Chinese have created the best assault rifle cartridge ever fielded by any army, but -- like the 7.62x39, 5.45x39, and 5.56x45 -- it would still have to be augmented by a long range cartridge for sniper rifles and machine guns. The 6mm Optimum concept is to provide a single, relatively lightweight round that can be used in the standard infantry rifle, sniper rifle, and machine gun, thereby simplifying logistics. It is with no little joy that I find the entire military rediscovering the teachings of the great Master, LtCol John Dean "Jeff" Cooper, USMCR (Retired). To establish my credentials (which I would ask you to keep confidential), this time last year I was a senior small arms analyst at the National XXXX in XXXX until old age and the mandatory removal date for an old reserve LTC of Cavalry caught up with me. I was alerted for mobilization one hour after the second jet hit the second tower. However, the poodle shooter, as Colonel Cooper refers to the M16 series rifle has been a mixed blessing. It is light, easy to shoot and at close range effective against civilized foes. However, we seldom deal with civilized enemies anymore and the Afghans are not even close! Never have been, never will be. The M16, especially at range, lacks shocking power. Common in Vietnam. And, not changed today. The trade off is that we do not have the training base required to teach the youngsters to shoot a 7.62 NATO caliber rifle (not to be confused with the 7.62 Soviet which is primarily what the Taliban have/had). Even the master marksmen, the Brits and the Germans have adopted the 5.56mm NATO. The UKs Army doesn't seem to mind as the SA-85 does not work reliably anyway and the Bundeswehr cannot afford to adopt the G36 as they are too expensive. Not even the US Marine Corps goes for the 7.62 NATO anymore and they actually expect their riflemen to be able to shoot! THAT IS THE LAST THING THE ARMY IS WILLING TO SPEND MONEY ON. And, now I see in the USMC publications that they have rediscovered the M1911 .45 ACP! Seems that the shooters are dis-satisfied with the M9 in action. Perhaps we could arrange a trial in the Philippines again...just like 1911! Are there any Moro's left? Again, this goes to an issue of training. There is nothing so effective as a .45 Automatic with a trained operator but where are we going to get those? Certainly not from the US Army. You know the FBI may be able to help as all of their SWAT trained personnel are authorized the M1911. And, we have rediscovered THUMPER, which is Colonel Coopers solution for arming REMFs! I think the Masters basic objective is that Officers carry pistols (leaves your hands free to pick your nose), Soldiers carry rifles (.30/7.62 caliber/mm rifles by God!) and REMFs have a short range personal defense weapon they can throw down before they run like rabbits. As to the SAW, it is neither fish nor fowl. Too light for sustained fire and too heavy for a subgun - junk 'em and issue the M240b MMG. There is no substitute in the dark of night for a tripod mounted (for infantry ops) medium machine gun in the sustained fire role. WELL, maybe danger close Final Protective Fires but that is a bit too much to ask - unless you have the King of Battle close. Ed: The US Navy has just ordered 492 Mk48 light machine guns for use by Navy SEALs. It fires the 7.62mm NATO round and weighs 17 lbs, about two lbs lighter than the old M-60 series. The Swiss now make a 6mm round.